Now it's just another mobile dating clone. When Lulu launched over two years ago, its approach to mobile dating raised more than a few eyebrows. Instead of connecting girls with eligible dudes nearby, the app let them share anonymous reviews of men they knew, complete with hashtags like "#LifeOfTheParty," "#TallDarkAndHandsome" and "#PlaysDigeridoo." Some loved it. Some were mortified. Still others wondered what the service could mean for the future of dating. The answer: apparently not much, because Lulu as we knew it is dead. A few days ago, the company quietly replaced its original app with a new version that cut out all of those juicy reviews in favor of a more generic -- and very familiar -- dating experience. Now, before anyone cries foul (or copyright infringement), know that Badoo has a white-label program that allows other companies to build services on top of its sizeable social network, and those companies seem to be able to just swap out logos if they feel like it. Lulu isn't alone, either. Consider Blendr, the app often referred to as Grindr's counterpart for straight people. Total Badoo clone. And remember Hot or Not, one of the best/worst ways to waste time in the early 2000s? It's goddamn Badoo again! We've reached out to both Lulu and Badoo in hopes of clearing up the exact nature of their relationship, but neither responded yet (and we're pretty sure it's a white-label deal anyway). At the very least, New Lulu/Badoo pays a little lip service to the idea of dating intelligence by showing off a ratio of how many times a person has been liked versus disliked. Still, the snarky, valuable and sometimes upsetting original has been replaced with a toothless impostor that mashes up features from rival services. It's not clear why Lulu took such a drastic leap, but we can hazard a few guesses. The one-sided nature of Old Lulu meant mostly women extracted value from the service; they'd get juicy tips on all the little things that did or didn't make a guy dateable. Naturally, being a guy on the other end could be tricky, especially if you got tagged with a string of less-than-stellar reviews. This experiential disconnect led to plenty of debates -- often about how the app could transform the conventions of modern dating -- that didn't make the process of building a functional business any easier. 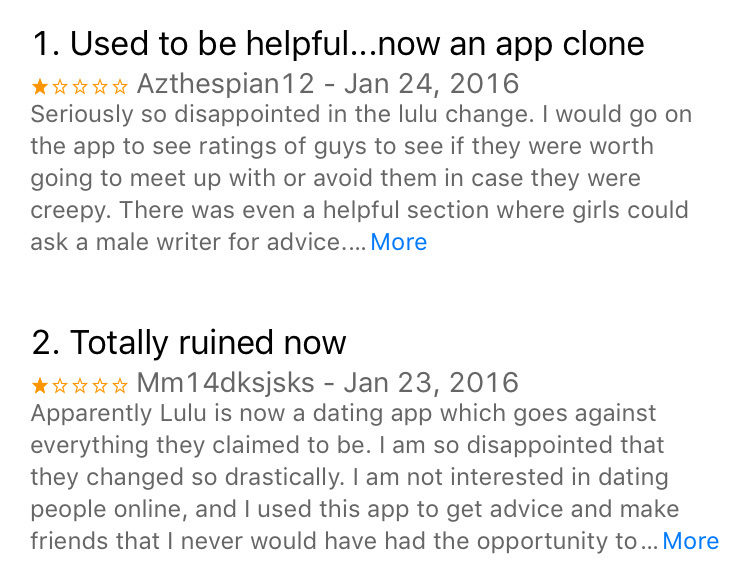 The revamp equals the playing field in that both men and women can use the service, but man -- if Lulu was looking for a competitive advantage, literally turning their product into a carbon copy of multiple others was not the way to do it.